So Term 4 has begun and even though we’re only at the end of week 1, I have to say I’m very happy that Labour Weekend is ahead of us and with it a welcome three day weekend! 2012 might not be quite done and dusted yet, in fact quite a bit still remains to do before I can say that, but I already have my 2013 Ideas Notebook open…..
……..and entries being made for consideration for next year. One of the ideas I played around with and ended up adding yesterday was thanks to a link and an idea Michele Coombridge posted on the SLANZA Facebook page. The Catalog Card Generator is a neat little tool which is fun and very easy to use. It is similar to the Newspaper Clipping Generator that’s been around for several years and some of you may have seen and used it. 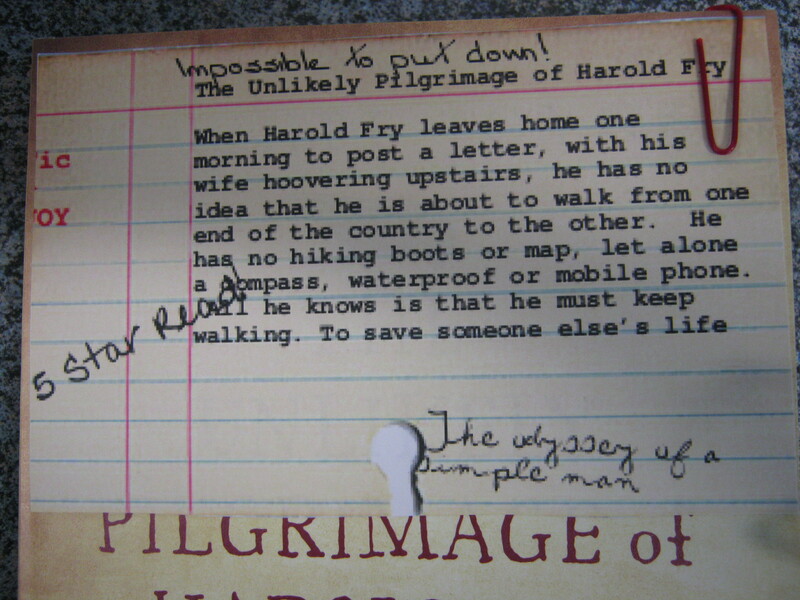 The Catalog Card Generator allows you create an old-fashioned manual card for any book you want to, complete with scribbles on it for a little authenticity. 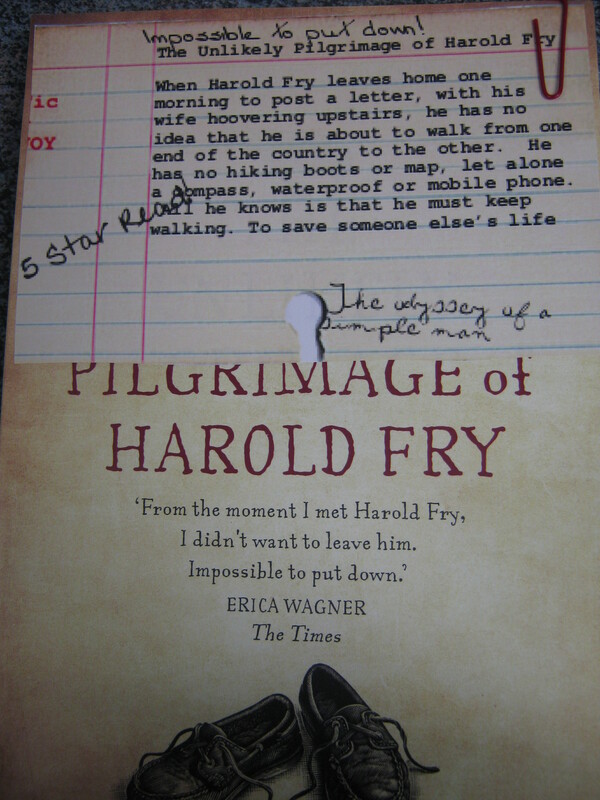 Michele’s great idea was to use it to promote a book which has just a black cover. This visual highlighter will work nicely with some of our ideas for promoting specific books next year. Sincerely, a big thanks to you Michele for sharing this simple but great idea – and not just the link! With the overwhelming number of links and emails I receive each day it’s impossible to explore them all so the links shared that actually have a suggested use or a “this is how I use it” story means I’m more likely to take a look at it. The great ideas don’t always have to be the big ones. Sometimes they are the very simple, easy but extremely effective ones that have already worked for someone else. Power Searching with Google: We all want to get better at “finding stuff” on the internet – and those of us in education really want to become as skilled as possible in finding the “good” stuff so we can teach our colleagues and students to also become proficient finders and users of information based on their needs. I was peripherally aware of the buzz around these Google sessions a few weeks ago, but just didn’t have the time to follow up on them so I was very pleased to see a link to the series of lessons via Google Research on Twitter. Now that I know where to find them I’ll work my way through each lesson over the next few weeks, noting down anything new I can highlight in my searching the net lessons. 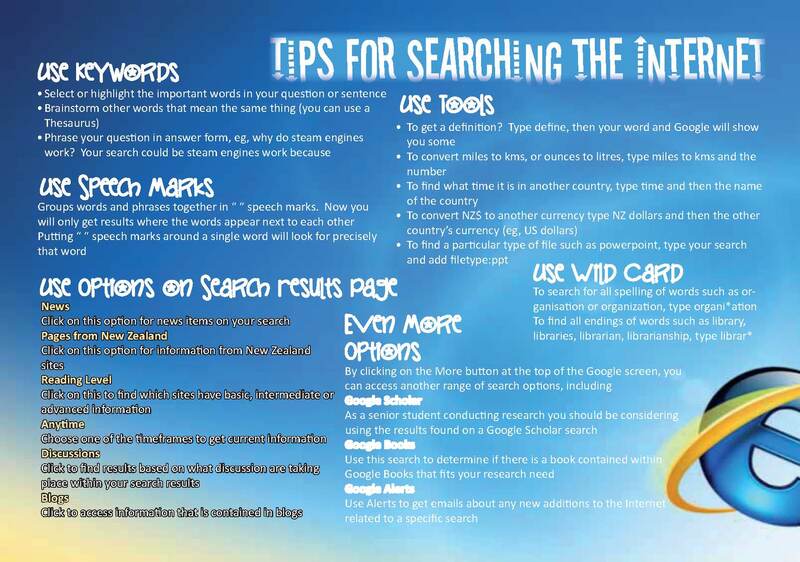 I’ve recently developed two new posters for students to use when searching the internet. These work very well and students seem to like using them. Now, I’m not an expert on using iPads in the classroom. In fact, I suffer from iPad envy as I don’t even own one!! (though I do have a very nice Samsung Galaxy Tablet my lovely son bought me for Christmas). But one of the ways I support my teaching colleagues is, I share information with them that might be of interest. So this is how my email user group for iPad Apps and their use in the classroom came about. I was finding so many useful websites and blogs by practitioners and experts via my wonderful Twitter people that I surveyed staff and found out who was interested. I’ve also created a iPad Apps Livebinder and I save all of these valuable resources into one space. And so, if you’d like to be added to my email group I’d be happy to do it. Just either email me, reply to this blog posting with your email address or you can just check the Livebinder when you have a need. Also, you can help me. If you have found a particularly useful website to do with this topic, please let me know and I’ll share it with the group. Presenting at the LILAC Conference in Glasgow last month was a definite highlight in my career. The whole conference was amazing and I intend to blog about the things I heard and saw as well as the people I met and spoke to and connected with in the next couple of postings. In the meantime, for those of you interested in my Tertiary Prep work, I have now uploaded my presentation to Slideshare. It really is just the bare basics and I’m more than happy to expand on anything you might want more information about. Just make contact. While I seem to have been very quiet on my blog of late, I have actually been working very hard on it, as well as creating a new one. 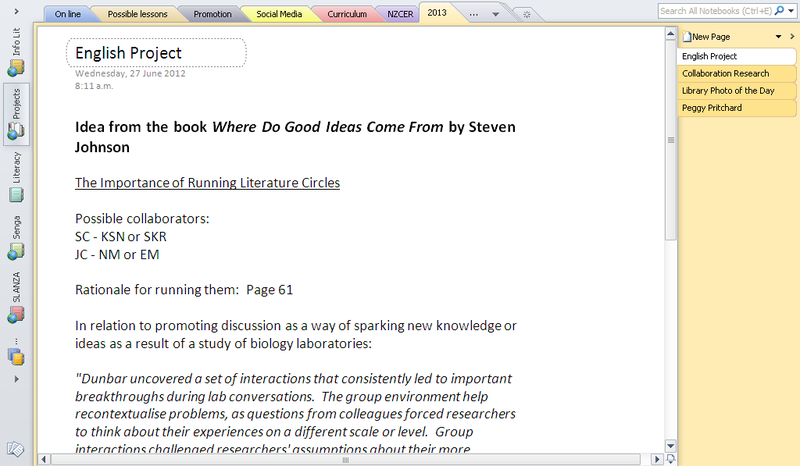 I have been adding pages to my blog, including both a Resources page and a Lesson Plan page. These both link to aspects of the James Hargest Libraries Information Literacy Programme, which began from a seed of an idea in 2005. These pages will not be static and I will continue to add resources I’m developing, trialling and using. For those of you who attended my session at SLANZA Conference in Auckland on Creating Information Literacy Opportunities in Your School, it’s been a bigger job than I thought developing resources in a format able to be shared easily, but it’s now achieved and so any of the units and resources I mentioned there should be found somewhere within the pages on this blog. I have also this past weekend created a Tertiary Prep wordpress blog to replace the existing Webs website as it gives me more flexibility for use. In the SLANZA Collected article published in November last year, where I wrote on my Tertiary Prep journey, the old website is mentioned but this is the replacement for it. This revamp has come about partly due to planning for my next presentation which is at the LILAC Conference (Librarian Information Literacy Annual Conference) in Glasgow in April. One of the conference themes for 2012 is transitions: from school through to higher education which is the area I’ll be presenting in. James Hargest is generously supporting my attendance at conference which falls during a planned private holiday in the UK. This site makes current events a little more accessible. Newsround is like an online magazine for quite young children through to possibly even Y9 & 10 students at a push. As well as news there’s sport, entertainment, book and movie reviews and games. A site for approx Y4-Y10 students with lots of interactive information from news-bites to popular geography games and a “weird but true” section. Try using National Geographic for kids yourself, or check out the Little kids edition for even younger children. Any Questions is an extremely worthwhile online homework help site for our Kiwi kids. An online librarian on tap to help with research questions and Many Answers will give good links to questions already asked. Another unique opportunity for our kiwi kids, we have access to this quality online encyclopaedia in every New Zealand school through EPIC databases, which is funded by the Ministry of Education. 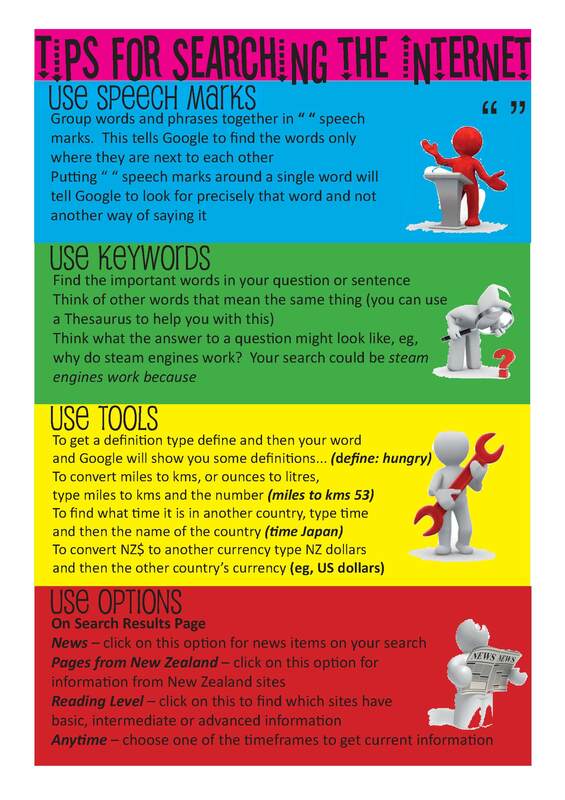 One of the things I like most about this resource is the ability to search by content level which is useful when working with students who need good information at an appropriate level. Lets face it ….. these kids are going to use Google, so here’s one way that you can help them navigate the information they find there. Try doing an advanced search (you’ll now find the advanced search by clicking on the little cog icon in the top righthand side of the page and this is their page to explain how it works). It will allow you to filter results based on whether the reading level is basic, intermediate or advanced. I’m sure there will be others you’ve come across which I’d love you to share with me. What’s your “go to” favourite? I’ve begun collating these treasures into a Livebinder, and I’ll add any recommended on my blog into it for everyone to share.